We recently moved to a new part of town, and we LOVE it! We lived off of Highway 280 for YEARS. We moved to Hoover and, it is like a whole new world over here! We've been having the best time finding new places to eat. 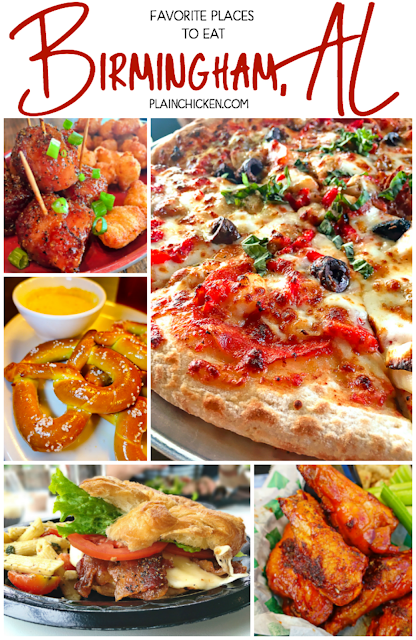 We've tried several places and have four favorites. If you follow us on Instagram, you probably already know our favorites. We are there all the time! 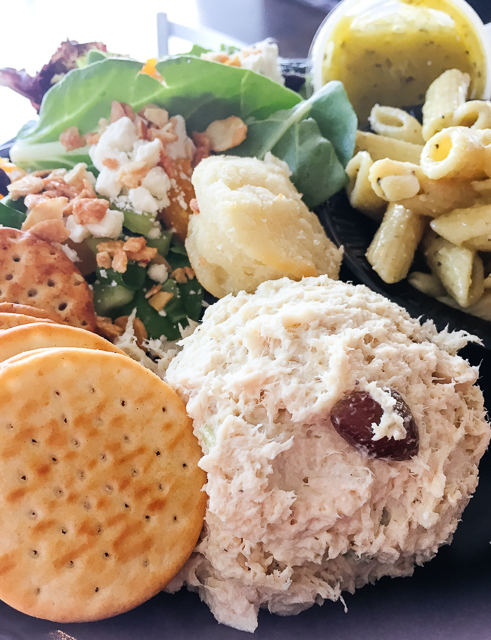 Ashley Mac's is known for their chicken salad. We agree that it is the best in town! 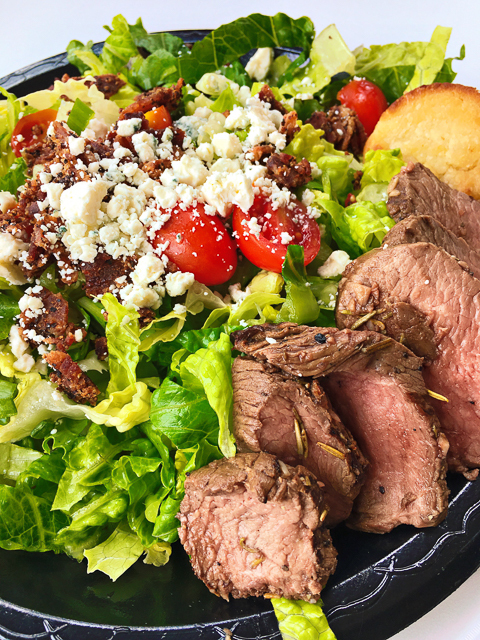 The Bistro Steak Salad is incredible! 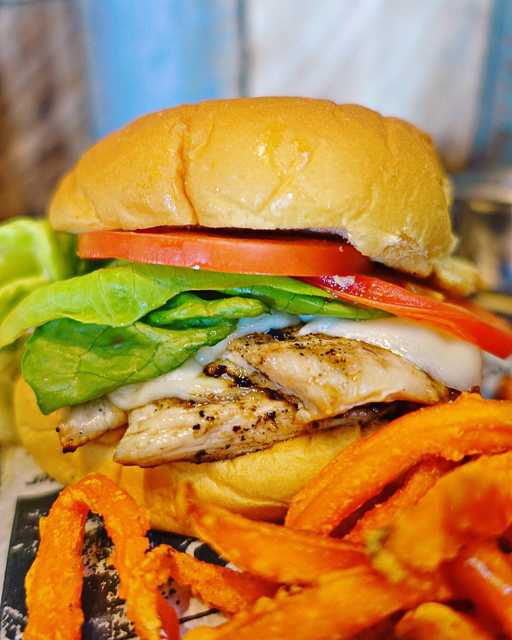 The Grilled Chicken Sandwich is my absolute favorite! 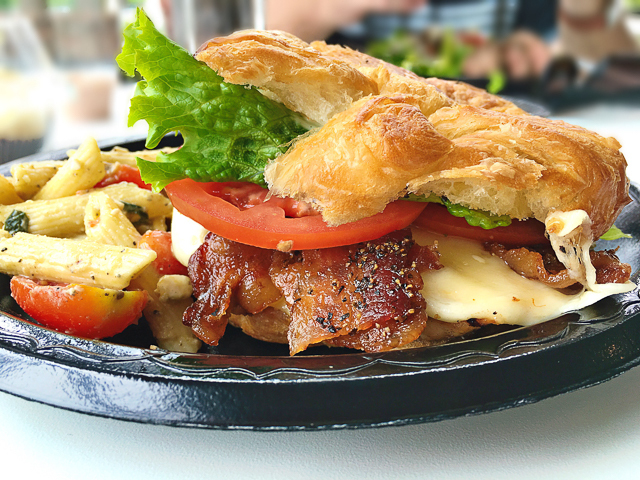 Grilled chicken, bacon, Havarti cheese, lettuce, tomato and homemade honey mustard served hot on a toasted croissant. 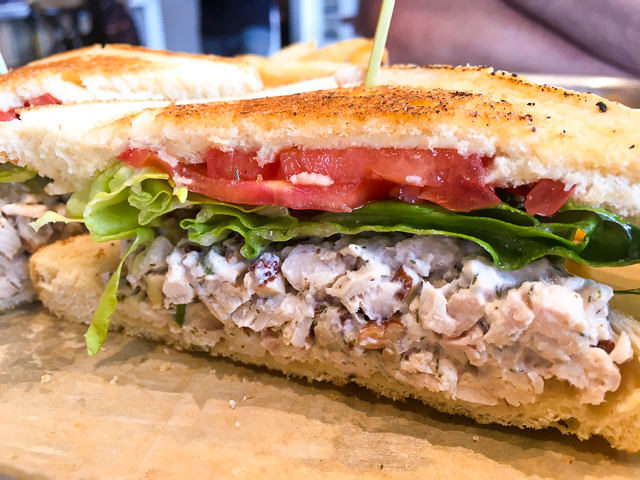 The Turkey and Spinach Aioli Sandwich gets two thumbs up! 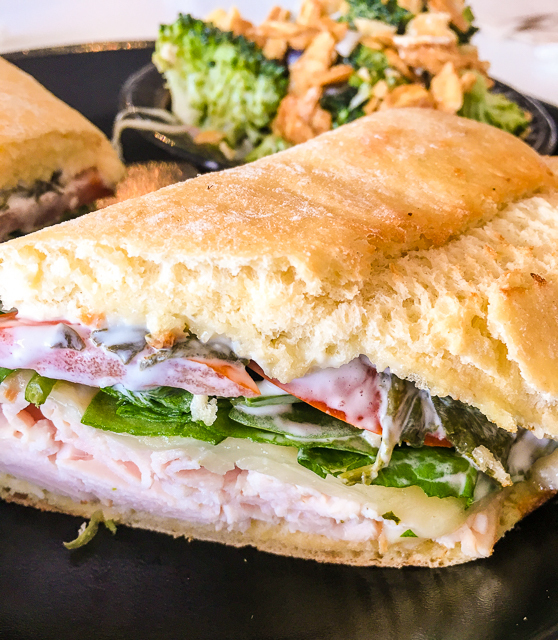 Fresh sliced turkey, tomatoes, baby spinach, Havarti cheese, and our homemade spinach aioli served on toasted ciabatta bread. 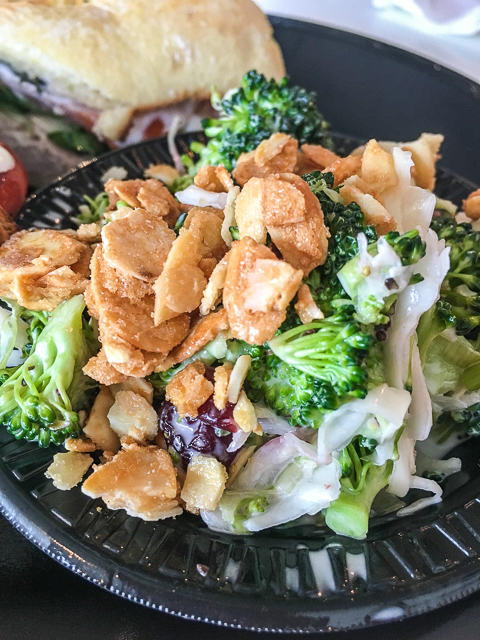 LOVE the Broccoli Slaw on the side! 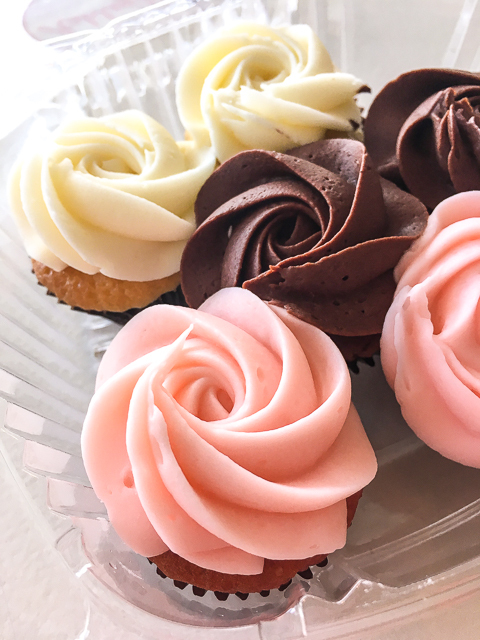 You simply can not eat at Ashley Mac's and not eat a cupcake. They sell packs of 6 mini cupcakes. I suggest the variety pack so you can pick your favorite. I know what you are saying. Beef O'Brady's is a chain. Yeah, it is. BUT it is right by our house and it is actually really good. The people that work there are super, super nice and there is a wide variety of food! 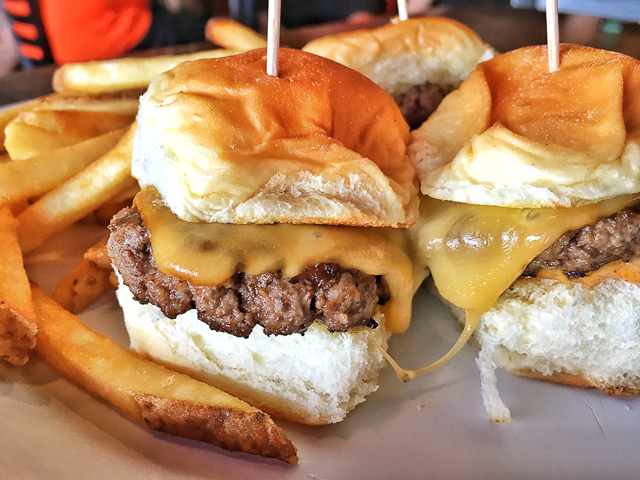 One of my favorite things to order are the Angus Texas Sliders . 3 fresh Angus sliders with smoked Gouda and cowboy sauce each on a King’s Hawaiian bun. Ask for extra cowboy sauce on the side - SOOO good! I mean, its a burger on a Hawaiian roll. Hello!?! The Chicken Tenders are surprisingly good. Real chicken battered and fried. 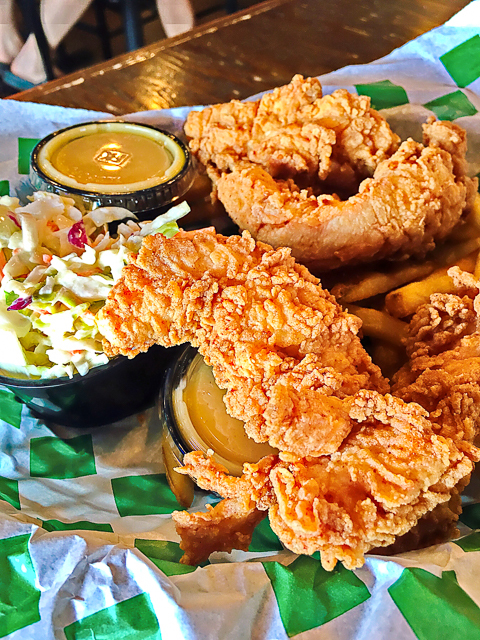 It comes with slaw and fries. It is definitely enough to share! I am a big fan of grilled chicken sandwiches. 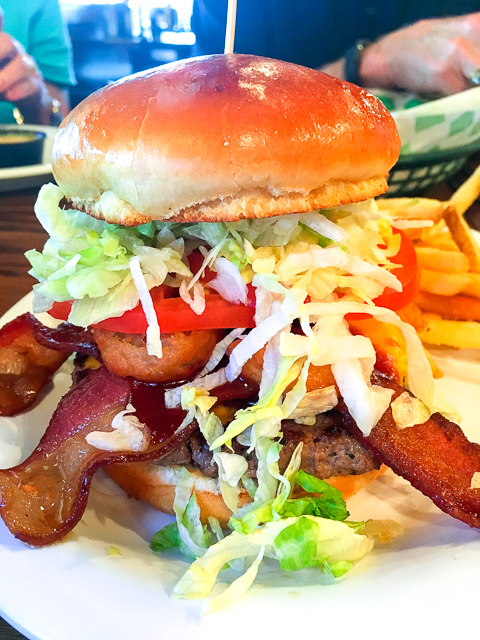 At Beef O'Brady's you can order any burger on the menu and substitute grilled chicken. 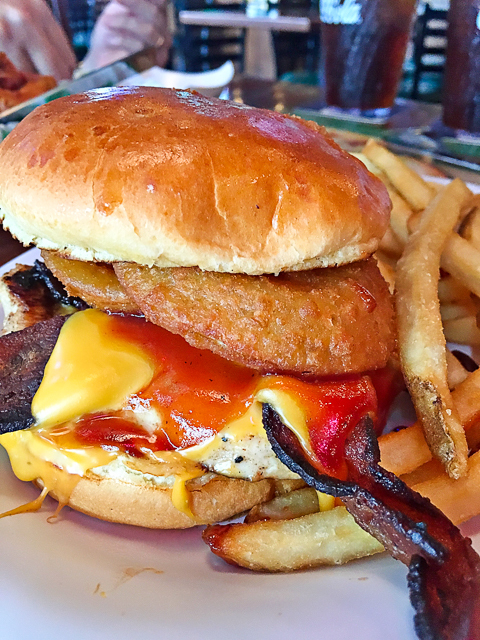 This is the BBQ Bacon Grilled Chicken Sandwich. YUM! Here is the BBQ Bacon Cheeseburger!! 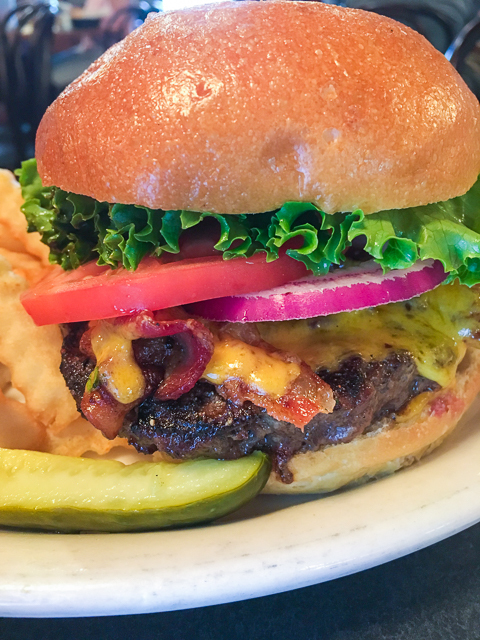 Fresh Angus covered with Sweet Baby Ray's BBQ sauce, melted American cheese, smoked bacon and two onion rings. Served with lettuce and tomato. 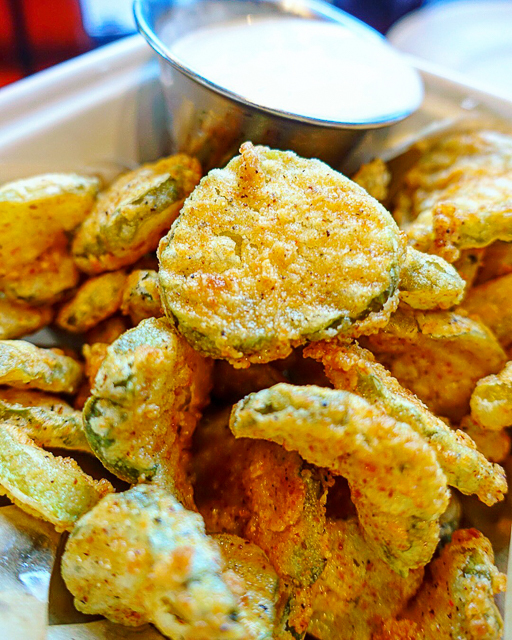 The Fried Pickles are great!!! 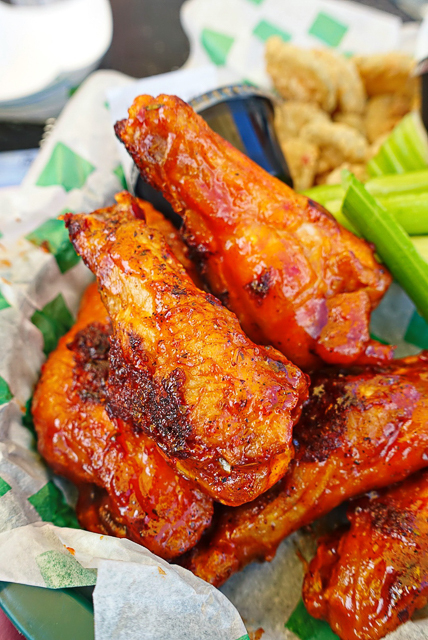 The Sweet Jalapeño Grilled Wings are crazy good! 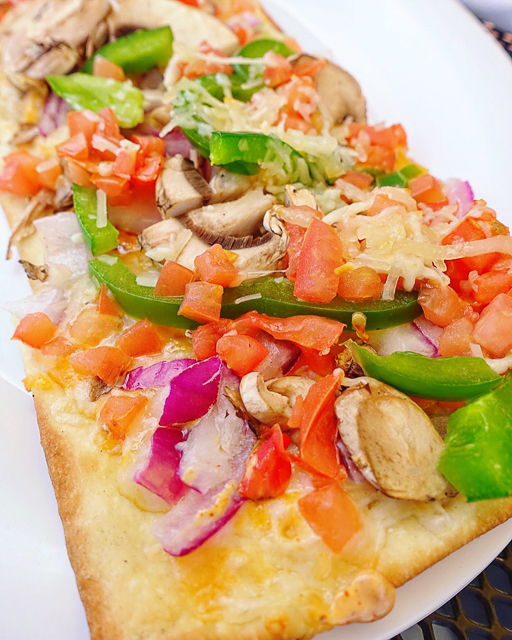 The Veggie Flatbread is great for an appetizer or main dish. 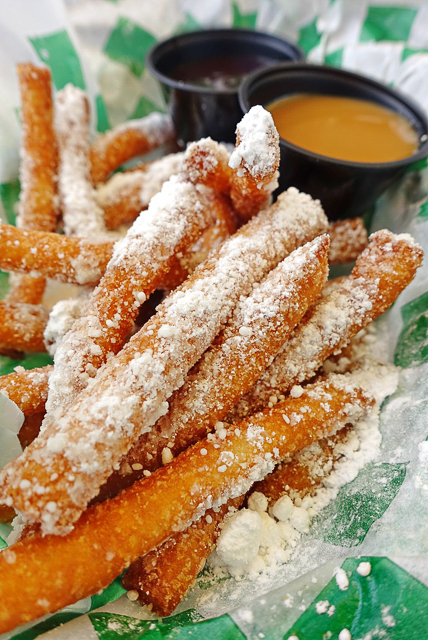 We couldn't pass up the Funnel Cake Fries with caramel and chocolate. Ragtime Cafe is one of my favorites. I would eat here once a week if Chicken Legs would agree to it. It is super casual with really good food. I love to sit outside and listen to the music. 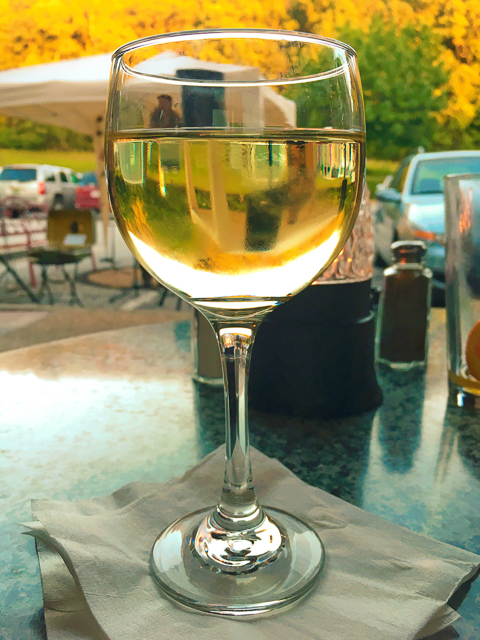 It is finally starting to cool off at night, so sitting outside with a glass of wine is perfect! 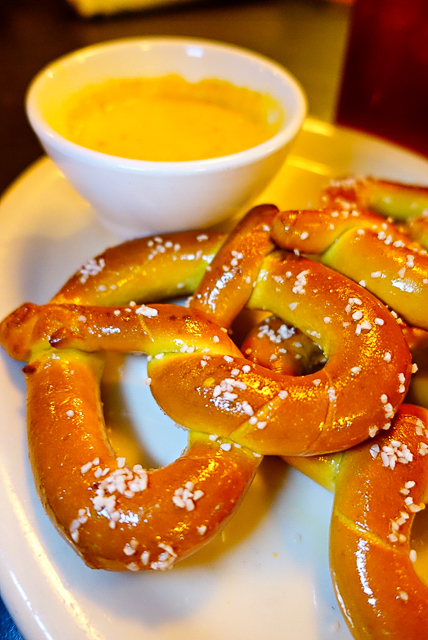 These Pretzels with Beer Cheese sauce are crazy good. We shared these with our table and totally regretted not getting our own order. Ridiculously good. This was the inspiration for my recent Beer Cheese Sauce recipe! 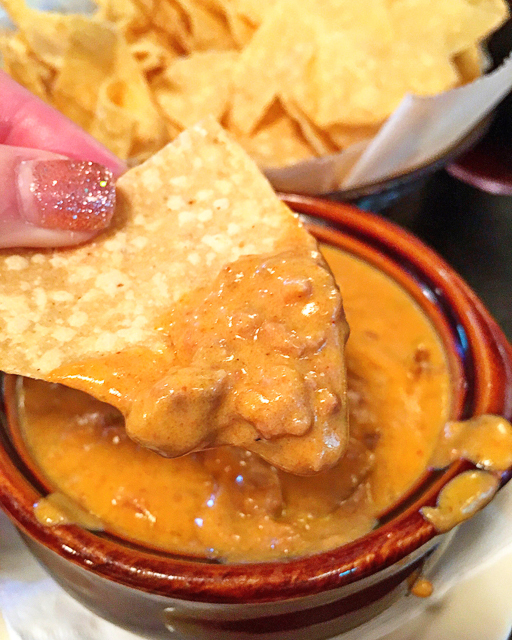 Ragtime's Queso is the best in town. I could make a meal out of this dip! 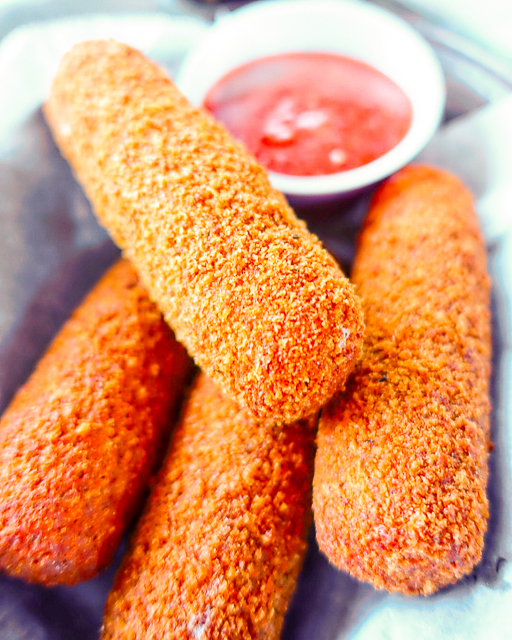 The Fried Mozzarella Cheese sticks are HUGE! I will take a photo with my hand in it next time so you can see how big these things are. 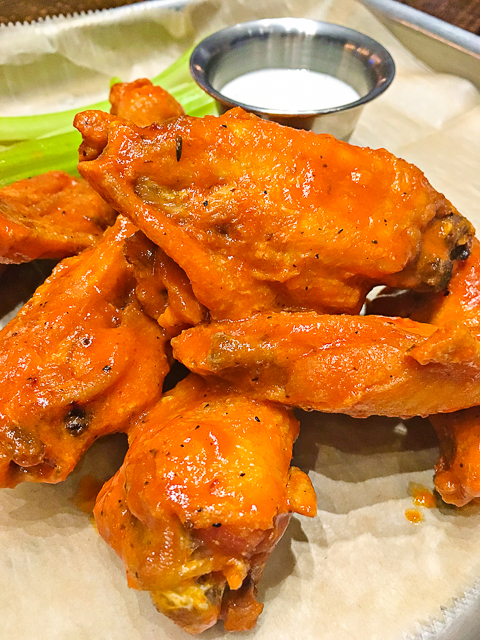 The Buffalo Wings are really good and really hot!! I mean, when they come to the table with jalapeños on top you know it's gonna burn! 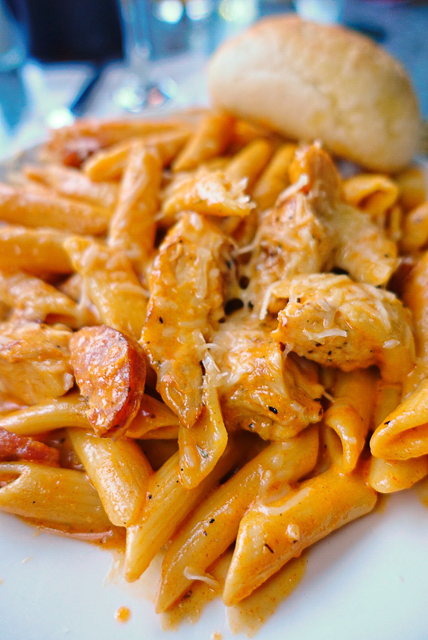 My absolute favorite thing at Ragtime is the Cajun Chicken Pasta. I dream about this pasta! Chicken and sausage tossed in a Cajun Alfredo Sauce. 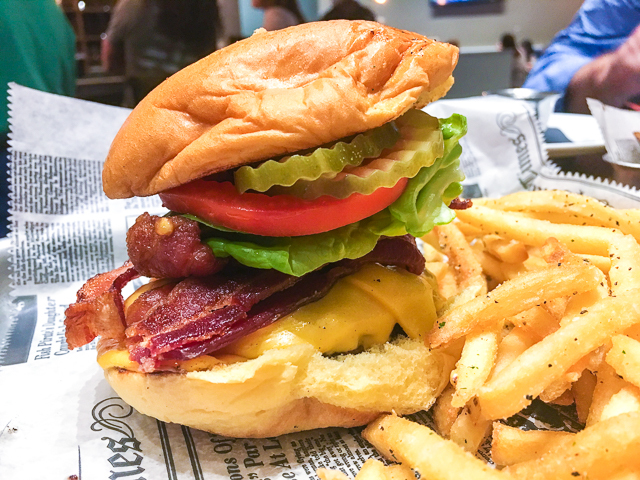 You know we can't pass up a good burger. We LOVE The Front Porch. It is really close to our house and has THE BEST food! 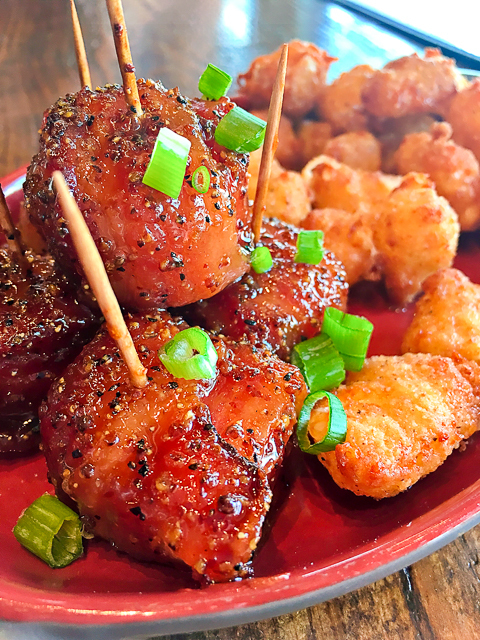 You MUST get the Candied Bacon Bombs with Fried Cheese Curds. This dish is life changing! The bacon wrapped smoked sausage is good, but the cheese curds. Oh my! 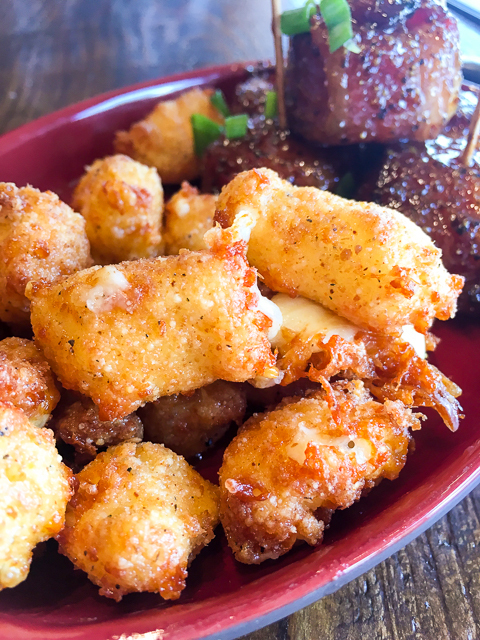 The cheese curds are amazing! AMAZING! We had to try the wings. They are really good. 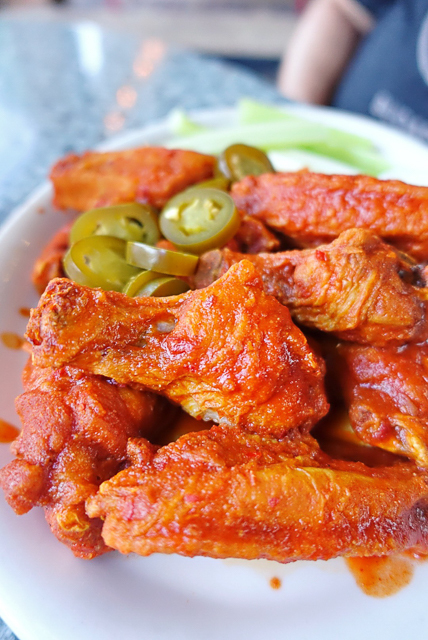 Hot but not burn your mouth hot. They have several flavors, we will definitely try them all at some point. 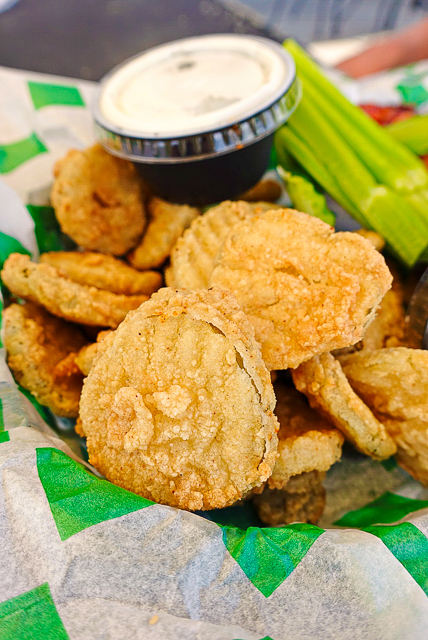 You can't go wrong with fried pickles! 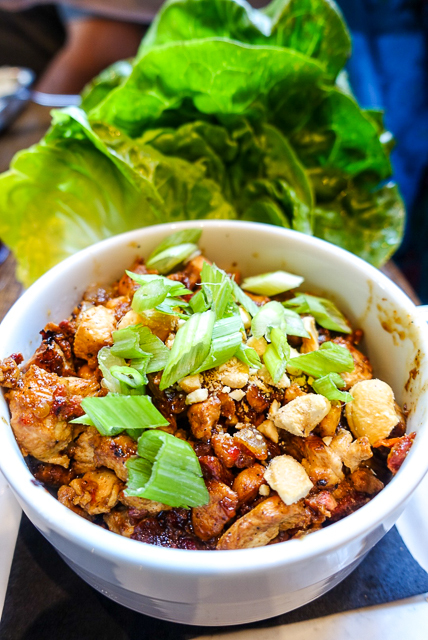 The Sesame Chicken Lettuce Wraps are a meal in itself! The Front Porch's Grilled Chicken Sandwich is in my top 5 ever. Two small chicken cutlets grilled to perfection. Topped with cheese, lettuce and tomatoes. Ask for a side of the jalapeño ranch to go with it. YUM! This Pulled Pork Stack is ridiculous. 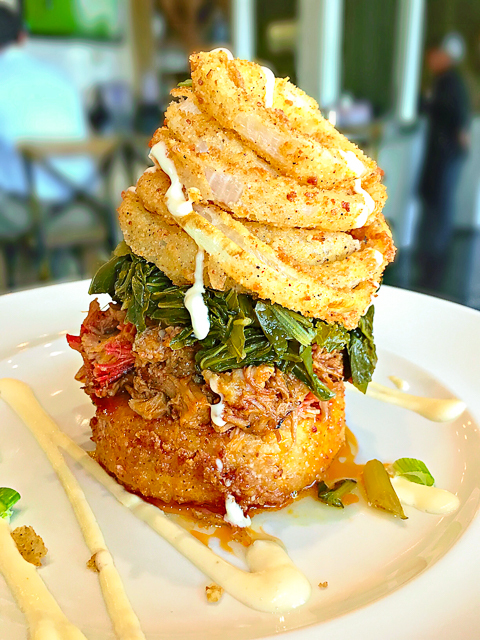 Fried Smoked Gouda Grit Cake topped with Pulled Pork, Turnip Greens, Onion Rings and White BBQ Sauce. WOW! The Mahi Mahi Sandwich is a winner! 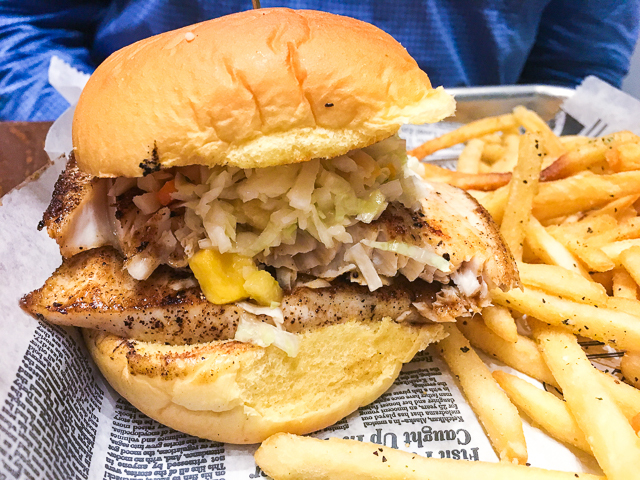 Grilled Mahi Mahi topped with a Mango Pineapple Slaw and served with an agave lime cocktail sauce. The Burger is a classic. It is the perfect size and I LOVE the bun! I added bacon, because why not! 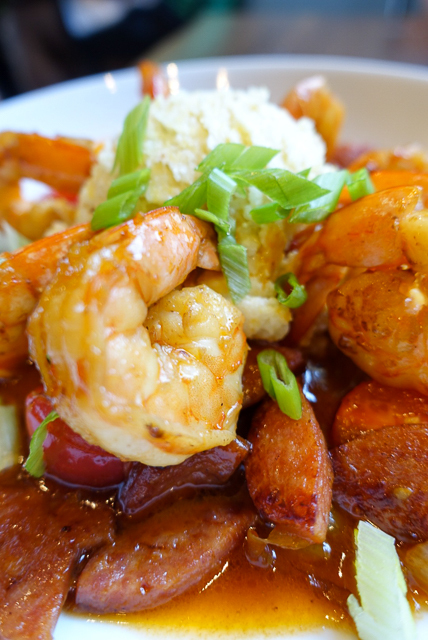 Shrimp and Grits is a Southern classic. 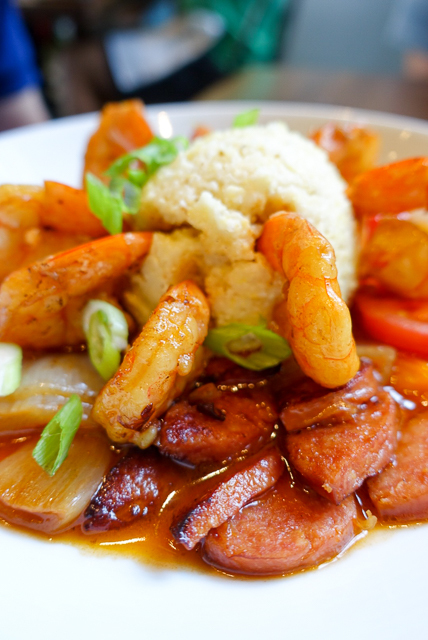 Shrimp, smoked sausage, gouda cheese grits and red eye gravy. The Chicken Salad sandwich is delicious. 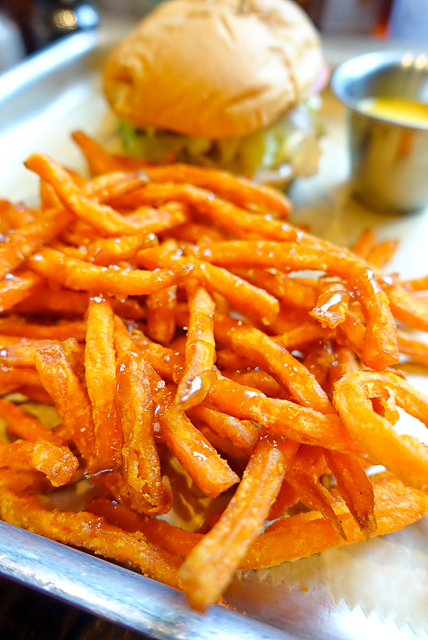 You MUST get the sweet potato fries with your sandwiches. They drizzle the fries with CARAMEL!!!!!!! 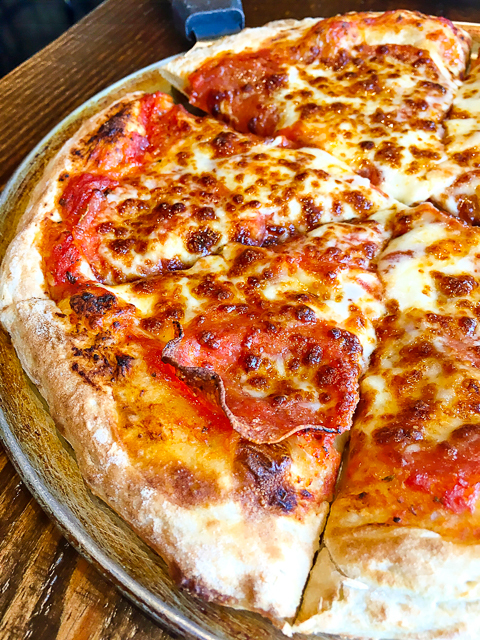 The Front Porch also serves pizza and it is surprisingly good! 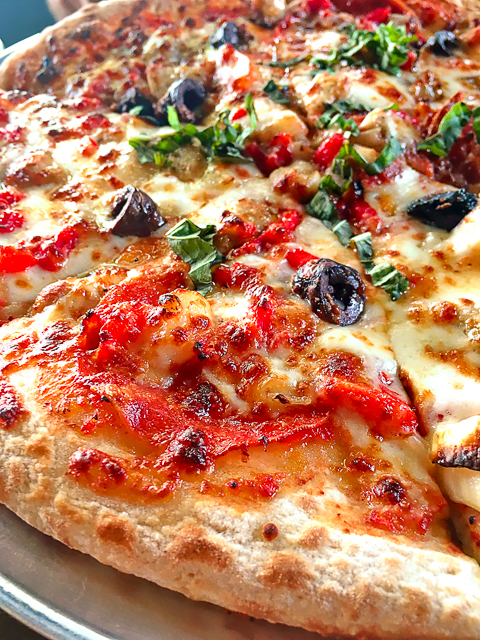 The Grand Avenue has pepperoni, sausage, olives, mushrooms, caramelized onions, garlic and fresh basil. Perfection! We have only managed to try one dessert. 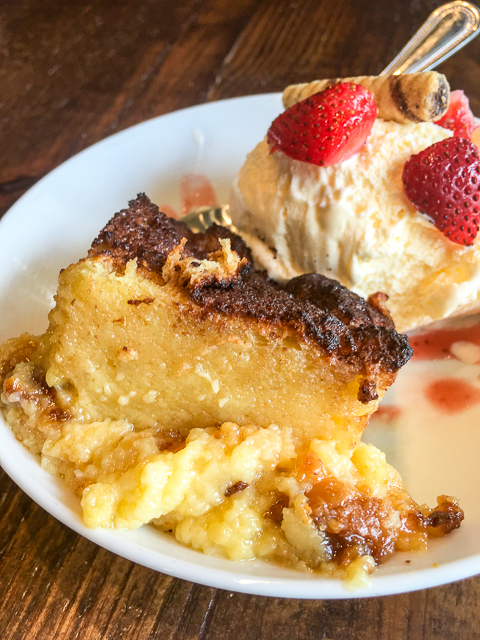 We went with the White Chocolate Bread Pudding. It was AMAZING! OMG! SO good!! What are some of your favorite places to in The Ham? We are always looking for new places to try!! Pablos at Promenade of Hoover- They have the best Chicken Fajita Nachos! Call me next time you want to go to Ragtime. I love it and don't live that far away. So excited to try some of these places. We live in Green Bay, Wisconsin and our daughter just started college at UAB in Birmingham so this will help us find some great places to go. Love your posts!!! I'm late reading this but what a wonderful selection of food. It would be hard to choose. Check out Melt over in Avondale...SUPER tasty sandwiches and great cocktails. Love Melt! I talk about it in another post on the site.